Friends of Ivory Hut: Rallying around our friend Erika. Rallying around our friend Erika. "Our house burned down last night. Barely made it out alive. Homeless, posession-less. But we're all safe & together. Still richly blessed." Now I don't know about you, but if my house just burned down to a crisp, I'm not sure if I would be as calm, cool, and collective as Erika. My heart sunk as I began to cry and all I could do is think about my friend and the hell she must be going through. I know she has limited access to a computer. She and her family is staying with a friend with a computer and managed to post this entry on her blog. Last night, my head was preoccupied with last minute work on a special project and putting the finishing touches on a post. My husband Tom and I had also been discussing the logistics of possibly attending BlogHer Food 2010 in San Francisco. These were the things that weighed on my mind. 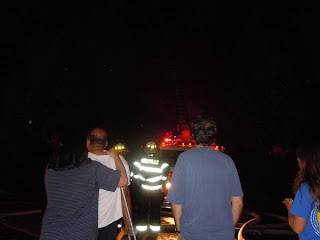 A mere hour or so later—and instant, really—we were outside, in our shirts and shorts, watching our house crumble as it was engulfed in flames. I’ll never forget that hissing and crackling noise as my husband’s home of almost 30 years practically disintegrated before our eyes. Oh, and I’m sorry there are no photos in this post. You see, my beloved Canon 5D and all those lenses I had? They’re gone too. Which stings, I’ll admit. But all I have to do is throw a glance my family’s way and yep, I’m still blessed. Erika is very loved among her friends. I spent part of my trip on the East coast with her and I consider her a sister. We both value strengthening relationships, building community, and empowering other bloggers to help them grow in their craft. What she must be going through now only God knows. But I cannot even begin to imagine what she and her family are going through right now. Many people in the food blogging community who dearly love Erika or people who have heard about this devastating fire have approached Erika's friends on how they can help. Maggy Keet of Three Many Cooks and I (Savory Sweet Life) spent the morning coming up with ideas of how best to support our friend in her greatest time of need. After going to the bank, I discovered it would be harder to open up a benevolence fund on her behalf without getting attorneys involved. And after speaking with other people who know Erika very well, we collectively decided that what she needs right now is cash to buy basic necessities until all of this can be sorted out. When she says she has nothing, she means it. In her email to me she jokingly tells me she is the best dressed person in her family because she is the only one with shoes on her feet. Maggy, one of Erika's closest friends, and I have been on and off the phone all morning and she is also very heartbroken over this tragic event. Together we decided to start this site as a way to help Erika. Because people have asked how they can help, we've come up with a temporary way to assist Erika quickly. We are accepting donations to help Erika immediately through Paypal. Maggy only lives one hour away and will take all the money donated and drive it over to where Erika is staying. She has no access to a bank because all of her identification was burned in the fire. Currently she is working with the police, fire department, and insurance people to sort through everything. If you have been moved to compassion to help our dear friend, fellow blogger, and all-around great person... Please consider donating via Paypal. Feel free to use Social Media such as Facebook and Twitter to get the word out. This is about community and helping one of our own. If you feel moved to write a blog post, we invite you to do so. If you would like to send a note of encouragement, please feel free to leave a comment on her original post here. I'm sure she would love to hear from you. I encourage you to give as you feel comfortable. Every little bit helps. Thank you for taking the time to read this. Our thoughts and prayers are with Erika and her family at this devastating time. Thank you so much for pulling this together for Erika. She is indeed a darling woman and I can not imagine what she must be going through right now. I know any contribution right now will be a blessing to her and her family. Erika is truly blessed to have friends like you. Thank you for putting this together. You both are amazing. We will spread the word to try and help as much as possible. Erika's tweet was the first one I read this morning and I was stunned, shocked and saddened for the devastation that has happened to her and her family. I am so thankful that no one was hurt. I was amazed at spiritual strength displayed in her eloquent post only after hours of such a terrible event. She is to be truly admired and is most definitely deserving of all love, comfort and aid that the social networking community can muster for her and her family. Thank you for putting this together in such a short frame of mine. I will do what I can to spread the word. This is such a tragedy. Thank God Erika has good friends like you to help her through this. I'll spread the word every way I can. I don't know Erika but fully appreciate the value of community and good friends. I happily made a donation on her family's behalf and will help promote this as much as I can. Thanks for being such a good friend to her. I don't know Erika either, but if she's anything like the people I met last weekend at #IFBC, and it sounds like she is, I can't imagine not helping out. I haven't had the pleasure of meeting Erika, but her story had me in tears this morning. I am happy to contribute to her desperate, but not hopeless, situation. Thank you for setting up this site to help our dear friend Erika. My thoughts and prayers are with you all. Erika is an inspiration. Sending my best to her and her family. Thank you for doing this, happy to help. Together we can all make a difference! Thanks everyone for all your sweet comments, prayers, good thoughts, RT's on Twitter, and financial support - every dollar helps. Erika has limited access to a computer and has no cell phone. If you've privately sent her a message or emailed her it may take some time for her to respond. Georgia: Thank you for offering your place.. I will pass this info on to Erika. If anyone has any questions, you can email me at savorysweetlife@gmail.com . Thanks again everyone. It is so beautiful to see the food blogging community rally behind one of our own. I'm sure Erika will be encouraged by all your thoughtful comments. I'm so glad everyone has pulled together for Erika. I know she has greatly inspired me, so it is the least I can do to help her out. Alice and Maggy - Thanks so much for putting this site together so that we can all help more effectively! I will get a post up about this in the next few days. This is truly a tragedy. Thank you so much for doing this for Erika! I have not had the privilege of meeting Erika but I'm sorry to hear of her situation. I am hearten to know that she has not let this get the best of her and am sending best wishes her way! Thank you all for your kind words and support. I can hardly believe that in ONE NIGHT we have raised $2,000 for our friend. That, my friends, is the power of this community. I know I speak on behalf of Erika and her family when I say THANK YOU!You are an incredible group of people. Posted a link on monkbot.wordpress.com to help spread the word. Thank y'all for putting this site together. Love to you, Erika. You are so special. I'm praying for you and your family. wow, what an inspiration she is being to me. I have not met Erika, but I know that real character shows up when everything else is gone and I already admire her. Count me in. I knew I wanted to do something, but didn't know how to go about it. Thanks for giving us a place to congregate. God bless Erika and her family (I guess he already did) and bless everyone that is helping, it is truly heart warming to see people help others! What a horrible tragedy. I am truly saddened to read this, but very impressed with her resiliency and positive attitude in the face of such a crisis. I will be glad to donate what I can when I can, and I will be more than happy to spread the word as well. Thank you Alice and Maggy for putting this together. Won't her insurance cover the costs to get new stuff? Thanks Alice and Maggy for your efforts. We would help spread the word and of course in other means as well. Thank goodness no one got hurt! But yes, what about insurance? If my home burned out, god forbid, I think I would be better off, I am over insured, as EVERYONE should be. My pics are on my keychain in a USB thingy. If I can grab my keys, I'm good. Even if insurance covers the cost of her lost stuff, it won't cover all of it and it won't help in her in the immediate future since she has no access to her bank accounts. Thank you, Alice and Maggy, for making it easy to help, Erika. I don't know her personally but love her blog and am willing to contribute. It sounds like Erika and her family are in good hands. :-) We will absolutely help. Thank you for putting a donation site up. I don't know Erika but I am so sad to read this.. the blogging community is so connected. I'm touched at the generosity and empathy from people who only know her via Twitter / Facebook or her blog. Even virtual connections and friendships can be so powerful. I'm happy to donate and spread the word via social media. Prayers for her family that they recover and rebuild in a new home. I don't know Erika, but I'm happy to be part of a community that reaches out to support each other. I'm happy to donate and will work on getting the word out. My family will be praying for Erika and her family. I've sent a message on my blog to increase awareness of Erika's situation. I wish the best for Erika. Thank you everyone for your thoughtful comments and spreading the word via Twitter, Facebook, and your blogs. The food community is truly amazing. Alice & Maggy--you are wonderful individuals and friends to organize this movement in order to help a fellow friend in this online community. I can only imagine how overwhelming this must be for Erika and her family to have absolutely nothing right now. I would like to help in a way that is quickest and easiest for all of you... which I gather is via Paypal, but need a little assistance in establishing who to send payment to. Can you please email me at the email address on my blogspot profile? Thanks. Never mind! The Donate link didn't work for me the first time, but I tried again and was directed to the right spot. I linked up to this site on my blog and Facebook. I don't know Erika, but I know the food blogging family is a great one, and she and her family are in my prayers. What a horrible story. Few of us can contemplate having all of our treasured belongings disappear over night. I know they are irreplacable but I hope our donations can help Erika's family begin to start over. Friends of Erika and Ivoryhut, I'm Tom, Erika's other half. Due to all the phone calls from all the interested parties (police, Insurance Company, Fire Department, Independent insurance adjusters etc.) I was basically unaware of what is taking place on the blog. Now that I know, I want to thank Maggie & Alice for their tremendous effort on our behalf. This is quite unusual for me, you see, I have always been self reliant therefore never becoming the recepient of any assistance. I was the one giving assistance. As I read through the blog and the comments I had to take by reading glasses that I bought at Wal-Mart for 19.99 off to keep drying my tears. Yes, my prescription glasses are gone. I have never been moved so much as to shed so many tears, it's a good thing no one is with me right now, they went over to a friend to do some laundry. Along with the heartfelt thanks to Maggie and Alice, I want to say a heartfelt "THANK YOU" to all of you who contributed to help us, you could not even comprehend how helpful and useful this is going to be. 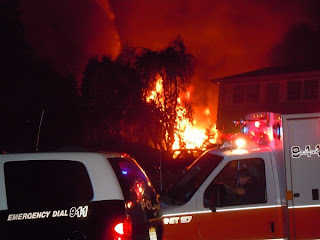 If you saw some of the pictures of the fire you would see a Pick-Up truck as well as a Honda Accord in the driveway. Funny thing is, from the road, they both look like they are in good shape however, on the side that faces the house, they are fried. The insurance company already told me they are a total loss. You would not believe how much work I put in to those two vecieles recently. I wanted them to last a long time since I've been laid off since July of 2009. I did not want any car payment :). Anyway, enough about me. Tim, my son, is the real hero. He went into the smoke filled house, went upstairs and rescued my 82 year old feeble mother out of her room and through the window onto the roof of our shed, onto the deck and all the way across the street by himself. Imagine running into the room of an old person and getting her out of bed forcibly and having her go to a window. I'm sure she felt that she was being attacked and resisted tremendously, but, thanks to Tim, he physically lifted this 160 pound dead weight of a person out through a window, down a roof, jumped down to a deck, lifted her off the roof of the shed and carried her some 300 feet to the neighbor's house. That is the real hero! Basically, if Erika and I were the only ones home we would be attending a funeral today. Frields, please, get an emergency plan together and rehearse it with your entire family. This is what I did 10 years ago when we added a second floor, IT WORKED!, kids remember. Also, buy fire extingushers and teach eveyone how to use it. IT COULD HAPPEN! We are grateful that we are all unhurt. I do not know how I would continue if I lost a member of my family, think about it. Anyway, I feel like I'm rambling but I do want to say THANK YOU to all of you who participated in one way or another. I'm sure Erika will continue to post comments to update everyone. I am moved to tears as I read this post and envision this tragic event and brave young man going back for his grandma...and I thank God everyone made it out. When I was a teenager, my parents stood by and watched as all their possessions went up in smoke. My father broke down and wept knowing all the hard years he laboured in that house...all gone in an instant! He was literally never the same man after that. He had nothing but hassles from the insurance company and eventually gave up on ever realizing owning his own home again. He passed away almost 2 yrs ago now and the pain of that event was still very real for him. My mother is 80 years old and lives alone and I often think about the fact that there's no one there to help her if anything like this should ever happen. I pray for her safety constantly. Thank you Tommy for commenting as well and reminding everyone to have a plan to get out. You and Erika are truly blessed to have such wonderful friends and I pray many more will be moved to help where they can. Oh how horrible and sad. But thank God everyone got out okay. Please know that Tom, Erika and Tim are in our thoughts and prayers. What is "Friends of Ivory Hut"? Friends of Ivory Hut is a community of food bloggers, photographers, and their respective communities who stand united in helping one of our own. On September 1, 2010, Erika Pineda (aka Ivory Hut) and her family barely escaped a devastating fire with only the clothes on their backs. We are raising financial support to help her during this difficult time. 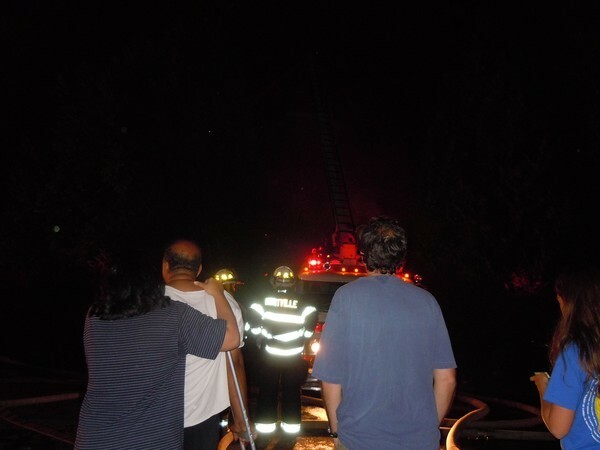 Read more about the fire, how this grass-roots site was started, and how you can help here. We encourage you to get the word out about Friends of Ivory Hut via Twitter, Facebook, and your blogs. Erika's Twitter Handle is @IvoryHut . The Twitter hashtag to follow updates is #FriendsOfErika . To leave Erika an encouraging note, please feel free to leave a comment on her post regarding the fire here. Updates to this site will be posted regularly as we hear from Erika. Thank you so much to everyone who has helped spread the word and donated financially to this cause. Your generosity is truly amazing. This site is maintained by Maggy Keet of Three Many Cooks and Alice Currah of Savory Sweet Life. If you have any questions about "Friends of Ivory Hut" please email Alice at savorysweetlife@gmail.com.